There are three types of multitasking. By multitasking, I mean the apparent simultaneous performance of two or more tasks. And since research has confirmed that it is impossible for the brain to fully focus on two things at the same time, all multitasking is not the same. The first and most obviously inefficient, and potentially dangerous, form of multitasking involves physically performing two tasks at the same time – both requiring cognitive involvement – such as talking on a cell phone while driving through city traffic, or text messaging while listening to a lecture on safety procedures. Only the first two are true multitasking, while the third one is simply making efficient use of time that might otherwise be wasted. This is not really multitasking and the worst that might happen is to forget to retrieve the printed page from the printer or forget to remove your clothes from the dryer. The fact is, you generally do get more accomplished in terms of quantity when you multitask, regardless of the type. But the quality is not there. And there could be time-consuming – or even disastrous results. Take a look at the diagram below. This diagram on the performance of simultaneous tasks was developed by Michael Posner back in 1978. 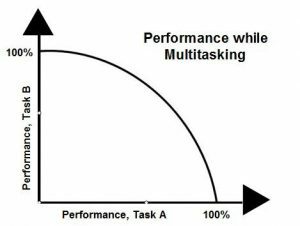 Most of us come down pretty hard on multitasking, but the diagram does illustrate that even though the brain cannot actually perform two tasks at the same time, it can switch back and forth very rapidly between one task and the other – giving the appearance of simultaneous performance. But in doing so we always have to sacrifice a certain degree of efficiency in the performance of each of the tasks. For example, if you are fully concentrating on “Task A”, depicted by the horizontal line, and ignoring “Task B”, depicted by the vertical line, you would achieve 100% performance on “Task A, and zero performance on “Task B”. But if you start to work on “Task B” as well, performance on “Task A” will decrease, following the curved line upwards and backwards. As an illustration, assume at this moment that you are getting bored with my explanation of multitasking because you have heard so much about multitasking in the past, so you decide to check your email as you read. You immediately start moving along the curved line from the point where it meets the horizontal “Task A line towards the point where it meets the “Task B“ line. So at that point you would be concentrating or performing about 85% on the reading task, and about 45% on the email task. The good news is that by the time I finish this chapter you will have completed your email, and if you add the 85% performance on one task to the 45% on the other task, you would have actually performed at 130% by your attempt at doing two tasks simultaneously. 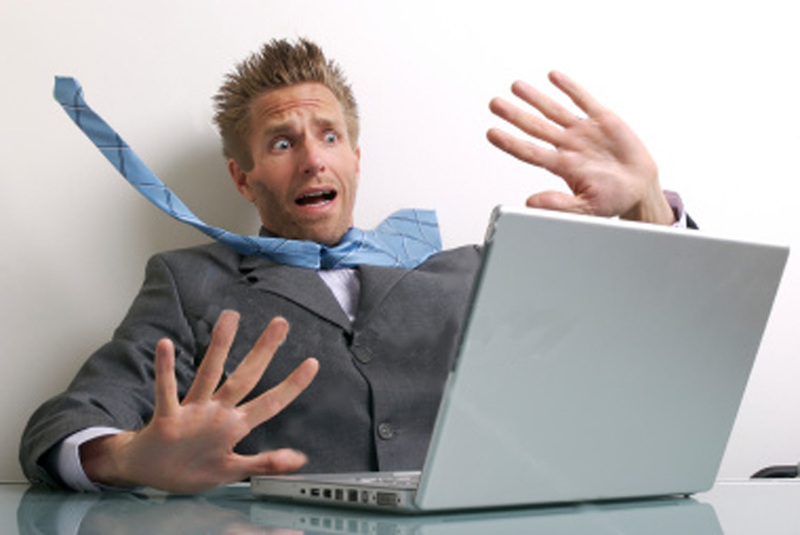 The bad news is that you may have made some glaring errors, beyond typos, when replying to your email messages. 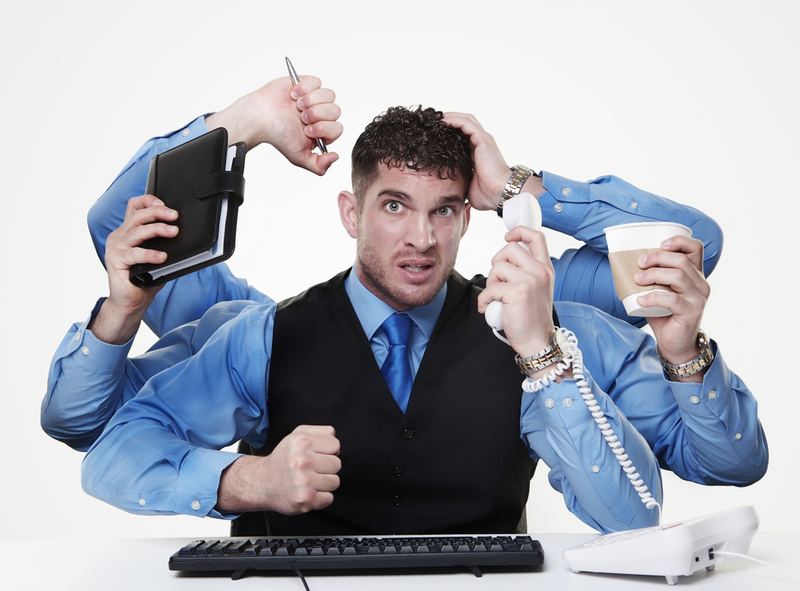 You may even have missed something important in this article on multitasking that could affect your own performance or that you could have passed on to your staff or others. You have to be the judge as to whether any multitasking is beneficial or harmful, and that’s why I emphasized that there are different degrees of multitasking. Missing or misunderstanding what I write, or failing to provide a complete answer to an e-mailer’s question might not be important. But I don’t suggest you mentally rehearse a speech while strapping a child into a car seat. 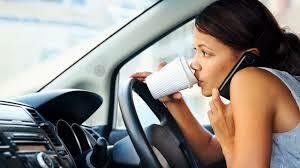 The impact of irresponsible multitasking is now so obvious that it cannot be ignored. The Human Factors and Ergonomics Society estimates that 2600 deaths and 330,000 injuries are caused each year in the U.S. by motorists speaking on their cell phones while driving. Daniel J Levinson, in his book The organized mind, claims that multitasking also disrupts the kind of sustained thought usually required for problem-solving and creativity. So if you decide to conserve time by working on two tasks at the same time, be sure to consider the impact of making a mistake or missing something. On the other hand, don`t be paranoid and sit idly by while a 50-page document is being printed. There could be a paper jam, but hardly as costly as wasting your valuable time. 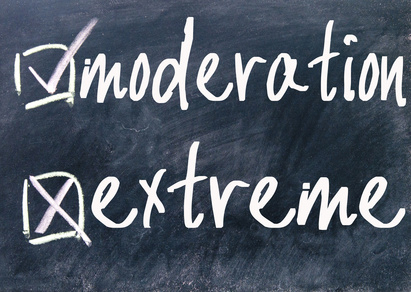 “Everything in moderation” includes email and augmented reality games. There are obvious signs that smart phones are being used in excess. For instance, as reported in the June, 2016 issue of Mindful magazine, a one-ton, 20 foot sculpture outside Salisbury Cathedral had to be moved because too many people walked into it while staring at their cell phones. And as pointed out in an Associated Press article appearing in the July 2, 2016 issue of TelegraphJournal.com, online smart phone use alone averages an hour and 39 minutes a day – more than double what it was two years ago. Pokemon Go is the latest game that draws people to their smart phones. The July 18, 2016 business section of the Toronto Star ran several articles on this latest rage that has people walking the city streets and into lampposts in a search of virtual Pokemon characters. According to one research firm, it has been downloaded 15 million times already, and people spend an average of 33 minutes a day playing the game. There are consequences for compulsive use of smart phones besides the tendency to walk into statues or into the path of vehicles. The summer, 2016 issue of Scientific American Mind mentioned a 2014 study that sixth grade campers who spent five days without electronics were better at reading human emotions. And a study published in the 2015 issue of Pediatrics found that children who sleep near a small screen get an average of 21 fewer minutes of sleep without gadgets in their rooms. The hundreds of reports on the negative aspects of excessive cell phone and email use may be overkill – and perhaps even misleading. But everything has a cost. In Cal Newport’s book, Deep Work, he mentions the case of Tom Cochran, who in 2012 gathered company-wide statistics on time spent waiting and answering emails by his company’s employees. Combining time spent with wages paid, he calculated that his company, Atlantic Media, was spending over $1 million a year to pay people to process emails. There is little doubt that more time than necessary is being spent checking email. I believe it has replaced meetings as the one greatest single source of wasted time in business, and in many cases it may be used to avoid doing real work. Reducing time spent on email will not only save money, it may offer other advantages as well. Cal Newport also describes in his book how one team at the Boston Consulting Group took one day a week free of any connectivity inside or outside the company. As a result, the consultants experienced more enjoyment in their work, better communication among themselves, more learning, and a better product delivered to the client. When it comes to email, Pokemon Go or whatever the latest time-draining electronic activity happens to be when this article is posted, “everything in moderation” is good advice. Does technology really make us more effective? Getting more things done faster is no longer limited by technology, but by our brain. Our brain has a limited capacity for processing information, and this limit is being approached and frequently passed by the ever-increasing rate at which it is being assaulted by new information. In the past decade, Internet use has expanded by 566%. It is estimated that 40% of all people of the world are now online. According to the book The End of Absence by Michael Harris, by 2012 we were searching for information via Google more than 1 trillion times each year. We “liked” 4.5 billion items on Facebook and uploaded hundreds of hours of video on YouTube for every minute of real time. With over 6 billion cell phones in use, and the average teenager sending about 4000 text messages each month according to Nielsen research, it is not difficult to imagine the impact on our brain. Torkel Klingberg, in his book The overflowing brain, claims “boundaries are no longer defined by technology, but by own biology.” Torkel mentions a survey of workplaces in the U.S. that showed workers were being interrupted every three minutes, and people have an average of eight windows open at the same time. Ed Hallowell, who has written several books related to ADD and ADHD, coined the expression “attention deficit trait” to describe the ADHD -like symptoms being displayed by adults and induced by a business environment that is now characterized by a fast pace, rapid change, constant interruptions and information overload. The impact of multitasking alone is now so obvious that it cannot be ignored. The human factors and ergonomics Society estimates that 2600 deaths and 330,000 injuries are caused each year in the U.S. by motorists speaking on their cell phones while driving. Daniel J Levinson, in his book The organized mind, claims that multitasking also disrupts the kind of sustained thought usually required for problem-solving and creativity. He also indicated the impact of interruptions when he said the awareness of an email waiting to be answered can reduce our IQ by 10 points. Absorbing new information also burns energy. And it takes more energy to multitask, make decisions and work on demanding tasks. To maximize brain efficiency, we must protect our brain from energy- draining activities encouraged, if not caused, by technology. We must continue to use technology and all that it has to offer in order to improve both our performance and lifestyle. But we must do so in a manner that protects our health – including the health of our brain. 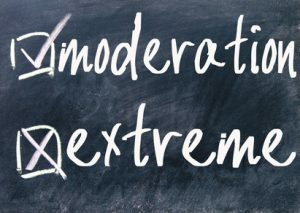 This involves judicious use of the Internet, control of technology, and the practice of moderation as opposed to excess.